← What can doctors learn from Shakespeare? 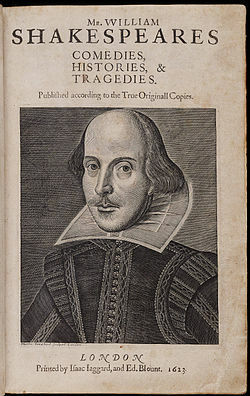 Not many books in themselves become the focus of other people’s work, but the 1623 edition of Shakespeare’s Comedies, Histories and Tragedies, commonly known as the First Folio, is no ordinary book. Professor Eric Rasmussen has just paid a flying visit to the UK where he’s been talking about the two, yes two books he has just published on the subject of this book. On Friday evening he simultaneously lectured at the Shakespeare Centre and was heard in a pre-recorded interview on Radio 4’s Front Row. Why two books? 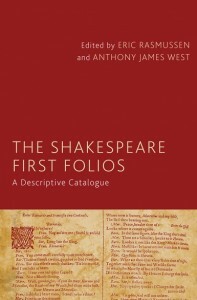 He and a team of researchers have been working for years on a massive undertaking, to document every existing copy of the First Folio, resulting in The Shakespeare First Folios: a descriptive catalogue. There have already been two previous censuses, one dating from 1902 by scholar Sidney Lee, the second, published only about ten years ago by Anthony James West in which 232 copies were identified as opposed to only 160 in Lee’s book. West also co-edits the new volume. This serious academic book, described by Rasmussen as “geeky”, contains descriptions of every existing copy including all the variants, manuscript notes and omissions. Being a bit of a geek myself I was fascinated to see how much detail is given for each copy of this most valuable of books. 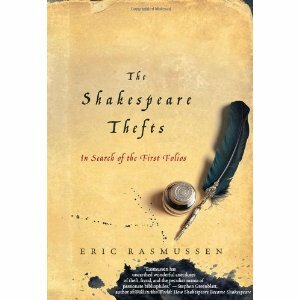 His second book, The Shakespeare Thefts: in search of the First Folios, is anecdotal and entertaining. In his lecture Rasmussen took a few examples of the strange but true stories that surrounds this book, and I was delighted that he chose to talk about the wonderful story about the Royal Shakespeare Company’s copy. I first heard RSC veteran actor Tony Church tell it in a lecture given in around 1980. He was one of a trio of actors, with Dorothy Tutin and Derek Godfrey, representing the RSC at a performance in the Vatican of Shakespeare extracts designed to celebrate the 1964 Tercentenary of Shakespeare’s birth. After the performance (the first theatrical performance that had taken place in theVatican), Dorothy Tutin came forward to the Pope, holding the RSC’s copy of the folio, with the intention that he should bless the book. Clearly misunderstanding the gesture, the Pope walked off with it in his arms. Somehow he had thought the book was a gift for the Vatican Library, and it was several embarrassing minutes before the book was returned. The story was widely reported in the press, and still stuck into the book is a small typed note, explaining that the book had been taken to Rome and blessed by the Pope. The last sentence has been crossed out, presumably because it isn’t known if it was ever blessed. After this escapade, the book was returned to the vaults of the Shakespeare Centre. When Tony Church used the Library several years later, I asked him to repeat his story, which until then I had never heard anyone else recount. This is one of three copies of the book kept at the Shakespeare Centre Library and Archive. One, the most incomplete of the three, is on permanent display for all visitors to the Birthplace to see. The other, the Ashburnham copy, owned by the Shakespeare Birthplace Trust, is also cared for at the SCLA. More recently the SCLA has played a part in another story about a copy of the First Folio, the high profile case surrounding the theft of the Durham copy. This copy was brought to the Folger Shakespeare Library in Washington DC by the flamboyant Raymond Scott, who claimed to have found it in Cuba. The librarians at the Folger were immediately suspicious. The SCLA was contacted as it contained Sidney Lee’s archives, including the original returns for his census of Folios. These returns included far more details about markings and variants than were included in the printed version, and enabled the copy to be positively identified even though all the obvious signs of its ownership such as stamps, notes and even the book’s binding had been removed. Scott was eventually found guilty of handling stolen goods though the theft itself could not be proved. This entry was posted in Legacy, Shakespeare's World and tagged Anthony James West, census, Eric Rasmussen, First Folio, Shakespeare, Shakespeare Centre Library and Archive. Bookmark the permalink. Clare Walton reminded us of an incident when she and David Howells took a first folio from the SBT collection, to be shown on the first national lottery show with Noel Edmunds. They made sure that everyone had been told not to touch it, except unfortunately Noel Edmunds didn’t know. At the climax of the show he grabbed the book off it’s stand much to shock of everyone else. He later apologized.